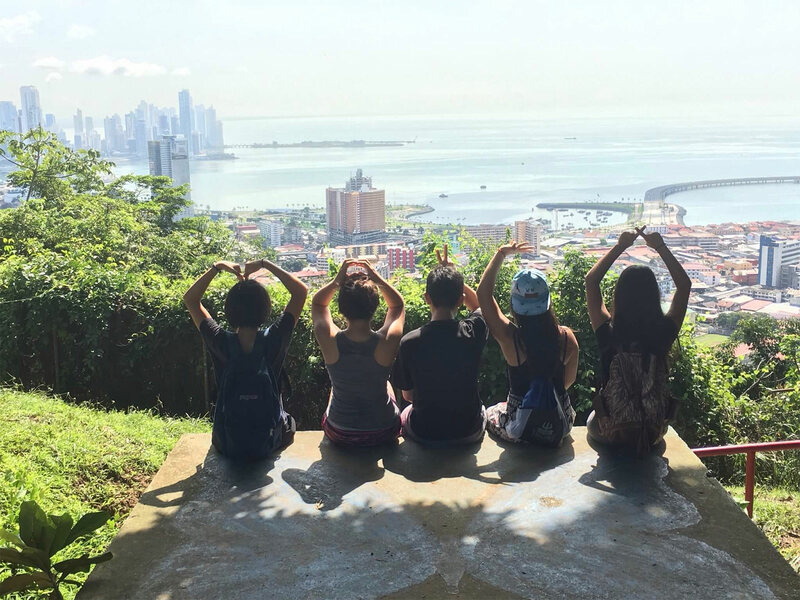 Panama has a wonderful nickname – Puente del mundo, Corazon del Universido. In English, it translates to Bridge of the World, Heart of the Universe. The “Bridge of the World” comes from the Panama Canal and “Heart of the Universe” comes from Panama’s location on the world map. However, the nickname has a much deeper meaning for me. During my one week stay in Panama, I learned HOW to be the bridge of the world. I was able to appreciate cultural differences and learned how to connect people through dance. For this trip, it didn’t matter how good of a dancer you are, but how well you were able to connect with the kids and be a successful teacher. Being a bridge between two different people, cultures, or countries is an unforgettable lesson Panama taught me. I also learned to do everything I do with the Heart of the Universe – to be open-minded and compassionate. At the beginning of each class, we taught the teenagers that respect is very important in Hip Hop – respect for everyone and for yourself. Our goal was for them to develop compassion with respect someday. For example, Alice taught the Mongolian chopsticks dance at Aldea SOS in Panama City. We were already warned that the kids like to make fun of Asians and say things like Chinita and make squinty eyes at us. We barely experienced it the entire week because I truly believe that the kids respected us and didn’t want to make fun of us. One girl kept saying Chinita during Alice’s class but stopped after a little bit because no one else cared about what she said. Everyone else was paying attention to Alice because they really wanted to learn the dance. This demonstrate to me the progress of respect and compassion the kids developed to other cultures. So many people that we have met in Panama were so welcoming to our little group. From the kids at the orphanage, the university students, our dance teachers, to random bboys at the park next door or who stopped at Aldea SOS in Colon to battle one of us – thank you for the amazing exchanges we had. Those two values, being a bridge of the world with a heart of the universe, were the only things that really mattered during this trip. I learned to let go of all my spoiled expectations and materialistic values and just appreciate every moment. It didn’t matter what we wore, ate, if the water stopped running and we couldn’t shower, or it suddenly starts pouring outside – life is still good. It never stops the people in Panama from enjoying the day so why should it bother us? We are so spoiled with an excess of choices in food, clothing, music, phones etc. and take so many things for granted. When I gave one of the teenagers, Jonatan, my backpack, I remembered how ridiculous I was when I first bought this backpack. I spent too much money on a brand name (Hershel) backpack that was way too big for me. I never liked wearing it but the brand was so popular at that time. I even stopped using it after my graduation. When I gave the backpack away, I was so relieved to let go of this materialistic side of me and give it to an amazing owner who would really appreciate it – Jonatan, an orphan with dreams and aspirations just like me. We could have talked for hours about his dream to become the first male Olympic gymnast for Panama, our goals to become doctors, how many languages we both speak, or just about our love for dance. He loves learning languages because he knows the importance of it and it helps him connect with people. He is one of the most interesting people I have met and a friend I’ll never forget. Jonatan represents what Panama is to me – the bridge of the world, heart of the universe.